Rendering of the planned footbridge. Photo courtesy of Ed Carpenter. Pittock Mansion visitors often ask if they can walk to Washington Park from the Mansion and Forest Park. The answer? “Yes, but be careful crossing Burnside!” The warning is necessary; the intersection of the Wildwood Trail and Burnside is a known hazardous pedestrian crossing. With three lanes of traffic entering a curve at the trail’s crossing, visitors hiking between Forest Park and Washington Park must take extra precautions. 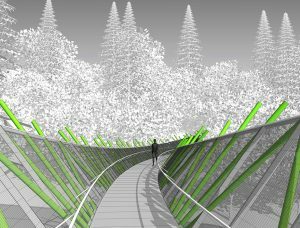 Two years ago, the Portland Parks Foundation joined forces with concerned community members to create a plan for constructing an elevated footbridge over Burnside that would connect Forest Park and Washington Park. Now, thanks to the generous support of the community, the Parks Foundation has reached its fundraising goal for the construction of the pedestrian bridge. Construction on the footbridge will start in early 2018 and is expected to be completed by the year’s end. For more information, and to support this and other Parks Foundation projects, please visit http://www.portlandpf.org/.